Spring began Saturday, and what a relief it was. Many of us could not have withstood another week of winter. Where I live, the wind was the problem — not the downpours. 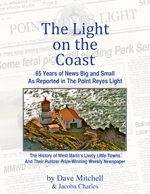 The rainstorms were, of course, badly needed by Marin County’s ranchers and water districts. For the horses in the pasture next to mine, it was a time to be relieved of the blankets they wore all winter to stay warm — but which made it hard for them to scratch itches. With their blankets gone, it was also time for a spring bath. A couple Arabians lay down in the Giacomini family’s stockpond while others showered by splashing themselves with water. 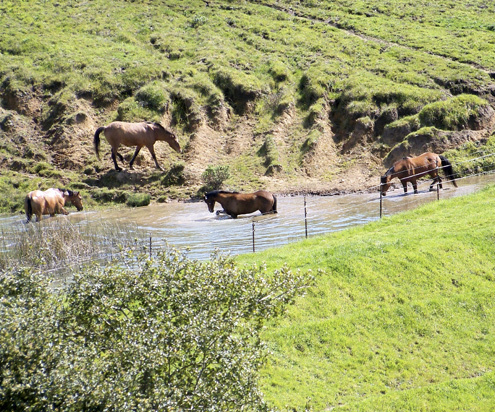 Once out of the pond, several horses happily rolled around on their backs in the green grass of spring. The wild turkeys on this hill pretty much ignore the horses, and the horses don’t mind having turkeys hunting and pecking around them. 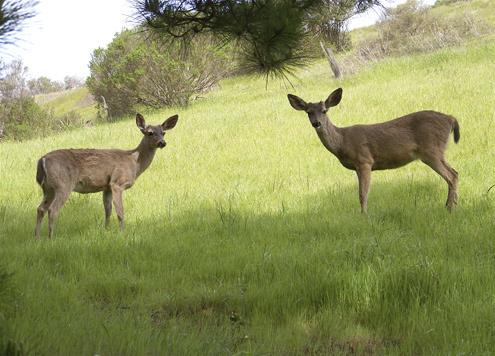 Two young bucks by my front steps Sunday afternoon. 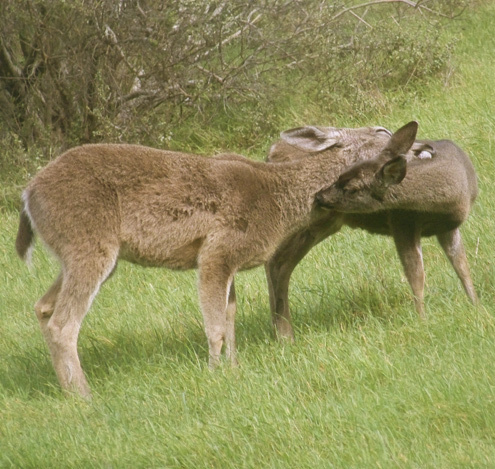 Two does groom each other outside my kitchen window. Researchers say this allogrooming, as it’s called, may be done for eliminating ticks or for establishing social relationships. 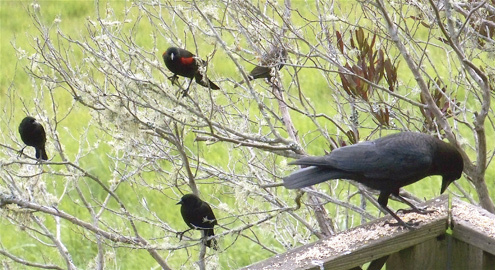 Four wary blackbirds waiting for a crow to leave before they can comfortably partake of birdseed I spread along the railing of my deck. 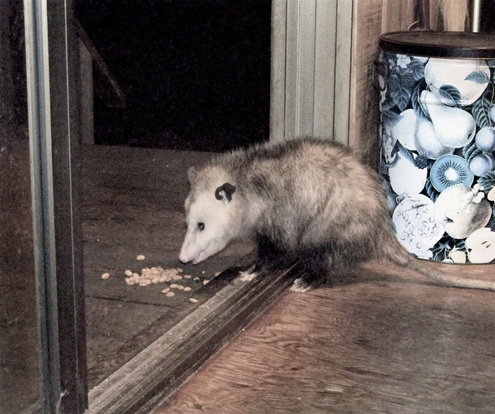 Possum in my kitchen leans outside to eat. As pictured in a previous posting, a female possum that hangs around my cabin allows me to pet her like a dog and scratch her behind the ears whenever I put peanuts on my deck for her. “Does the possum ever get in the house?” people frequently ask. The answer is yes, but it doesn’t happen quite the way one would expect. Twice I’ve opened the kitchen door to put out peanuts only to have the possum waddle into the kitchen and then lean back out the door to eat off my deck. I suspect she does this to stay out of the way of passing raccoons. It’s funny to watch, but at night the open door lets in cold air and bugs. The first time this happened I tried to gently push Ms. Possum’s tail out the door so I could shut it, but she instantly gave me a look that said she was offended. Now I’m not one to deliberately offend a possum, so I apologized instanter and proffered another handful of peanuts, which was accepted. Sparsely Sage and Timely is powered by	WordPress 4.9.10 and delivered to you in 0.892 seconds using 51 queries.